I was recently asked to make an anniversary card for some friends of ours. I was more than happy to do so and thought it would be the perfect time to play with some goodies that I won in Our Daily Bread Design's recent birthday celebration. This couple are still deeply in love - even 26 years later! She is a card-maker and he loves to help her in the craft room. They make a great team!! Their main wedding color was purple so I went with shades of that in the card design. The darker purple cardstock has sparkle all through it. 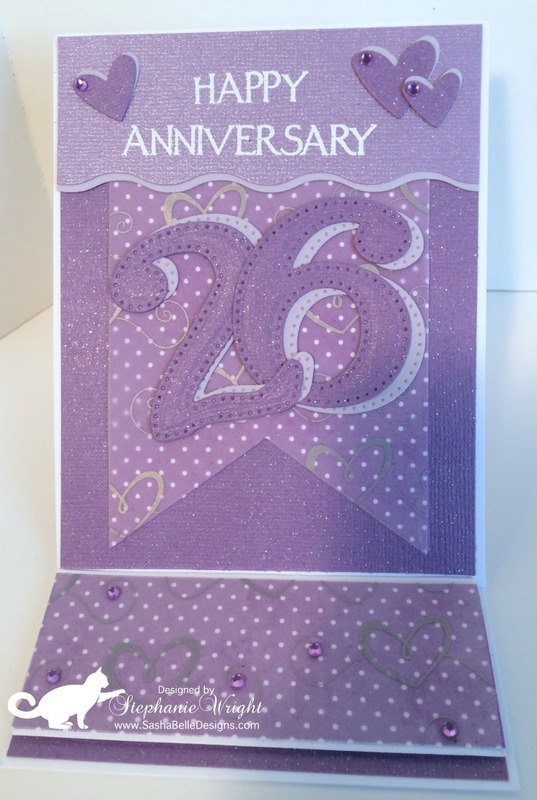 I cut and embossed the "2" and the "6" from the Large Number Dies out of a dark purple sparkly cardstock and also from a light purple cardstock. 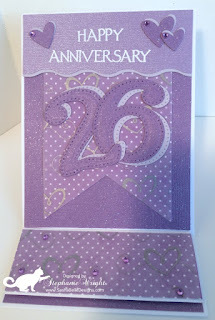 The sentiment from the Celebration clear stamp set was white heat embossing on the lighter purple cardstock. The dies and stamp set are also available in the 2017 Anniversary Bundle. 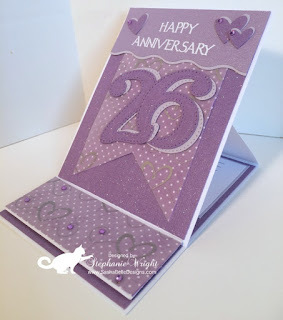 I used a banner die to cut out some purple polka dotted patterned paper and layered patterned vellum over it. I chose to make this an easel card for an extra special touch. The polka dot patterned paper was matted on some light purple cardstock and again covered with the vellum before being adhered to the bottom in the card interior with foam squares. This provides the stopper so that the easel part of the card will stand up. I created a custom sentiment for the interior of the card and matted it with the light purple cardstock. Some layered die cut hearts and purple bling finish off the card. So pretty, love the color and those huge numbers are perfect! Thanks so much for playing along with us at The Mod Squad Challenge Angie, Challenge Host. hello! this is adorable, luv the design! I am so glad you played along with us at simon says stamp wednesday challenge!